One of the many legends surrounding Scribner’s editor Maxwell Perkins (1884-1947) is that he was a terrible businessman. 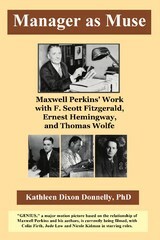 Manager as Muse: Maxwell Perkins’ Work with F. Scott Fitzgerald, Ernest Hemingway and Thomas Wolfe shows that he was definitely good at managing creative people. How did he manage to get such classic work out of such volatile creative personalities as F. Scott Fitzgerald, Ernest Hemingway and Thomas Wolfe, among others? And how did so many of his authors contribute to Scribner’s financial success over the decades? Starting with the excellent biography, Max Perkins: Editor of Genius by A. Scott Berg, I combined information from numerous other sources, including several collections of letters, to determine what management skills Perkins used to motivate these three larger than life characters. Through a detailed analysis of the relationships between Perkins and his three most well-known authors, Manager as Muse will give you insights in to how best to work with the creative people you manage, to motivate them to achieve success. Manager as Muse is available in the UK on Amazon.co.uk and in the States on Amazon.com, in both print and Kindle versions. You can also buy the original academic thesis on Lulu, but I highly recommend the download so you can sort through the academic theory to find the parts you like: www.lulu.com/spotlight/suchfriends.